What is a balanced aquaculture or aquaponic system and how many fish can you grow at home in a 1000 liter tank comes up often. Most of the answers I have seen are based around commercial capacities, which are rarely achieved at home. First of all we need to understand, while these aquatic systems behave in an eco system type, they are completely artificial. Meaning what you do to them plays the biggest role in the entire performance of the system. If you leave them to their own doings, the eco system will quickly die. The first limiting factor in any fish system is going to be oxygen and nitrogen, If you are growing fish we will assume you have the oxygen and nitrogen under control. In an aquaponic system nutrient accumulation or depletion is the primary limiting factor. All of the numbers in this table refer to a 1000 liter fish tank. So 20kg is 20kg/m3 or 20kg per 1000 liters. The green area is where I recommend you start out, the orange if you have some experience growing fish out and the red… well I would not be too quick to try that out at home. This is quite simply what we would call a plate size fish – 500 grams. The size of the fish is really irrelevant but it does help you decide on how many fish you put in your 1000 liter fish tank and what follows from there. This is in grams and based on 1.2% of the total body weight (biomass) of the fish in the system at full load. This is based on a 50% protein feed. Yes I know many of you will not be feeding such a high protein feed but if you have carnivores you might be depending on how big they are. This gives you some wriggle room. This is a product of the fish not the wastes. Solids wastes are assumed to be removed, if not increase everything by 50% and keep an eye out of elevated nitrite levels. This is only related to ammonia removal from your bio filtration in liters per hour, what ever that might be. It also assumes a maximum water temperature of 31 degrees Celsius and a maximum pH of 7.4. If your water temperature is higher, most Australian species will not survive or they will stress. If your pH goes above 7.4 at that temperature, the free ammonia (the toxic stuff) will be above the limit of 0.025mg/L. This is any media you like, which can be kaldnes type, gravel or what ever you like to obtain the required square meters needed for ammonia removal. We have assumed 1m2 of media has the surface area to remove or process 0.3 grams of total ammonia. For example if you have gravel it may have a surface area of 120m2/m3, and you have 20kg of fish you will need 40m2 or 300 liters of gravel to process the ammonia. We have also assumed your biofilter is only 50% efficient and you have no passive nitrification on tank walls etc, to give you more wriggle room. This is the amount of oxygen your fish and your bio filter (including autotrophic and heterotropic bacteria) will use in grams per hour, every hour of the day. This assumes you are feeding throughout the day so if feeding in one go, the oxygen demand will be higher for about 4 hours then be back to normal demand. This is when your system stops working from power failure, pump failure etc. I think it is important to know how long you have to get your back up systems in place and running. With 20kg in our tanks we turned the aeration off in the tank alone and we had something like 6 hours until oxygen levels were at critical. This assumes you have oxygen saturation in your water at 31 Celsius of 7.4mg/liter at zero altitude. This is to help you size the amount of watts required by an air pump using a suitably rated air stone (medium pore). Normally we recommend 20 liters per minute per 1000 liters of water but you can see at 20kg/m3 that would be border line. This is the amount of liters per day to be taken out and replaced to maintain Nitrate levels at a minimum of 80mg/L. This is purely recirculating without any plant integration. For example at 15kg/m3 density we would need to exchange at least 113 liters (7.5%) per day but at 50kg/m3 we would need to exchange 350 liters (35%) per day to maintain that 80mg/L Nitrate in the fish system. This is worked out of protein use after conversion by a plant. This is a very “soft” number because the type of plant eg: tomato, will use more than a lettuce, but it gives you an idea of the number of plants to support. Is yet another “soft” number. We have used a mega joule of 22 per m2 for an average in Australia over the last year for around the Tropic of Capricorn. While the solar exposure is a little higher than the south, some seasons have more than others. So we had to pick a number to reflect the worst case scenario. This is worked on a m2 basis with approximately 17 plants per square meter. Have a backup plan. Generators are the best choice and test it often. You will notice the 50 kg per 1000 liters requires a flow rate of 2.4 times per hour to keep the ammonia in check, but also it requires about 70 watts of aeration which is close to 80 liters per minute. You may have all seen our round air stones which are rated at 20 liters per minute, in this case you would need 4 of them in a 1000 liter tank to keep up with the oxygen demand of the fish and bio. I can assure you the tank will be more like a spa bath than a fish tank and the turbulence will destroy the flow in the tank and macerate the solids into such small bits you will never get them out. I suggest if you are starting out, take a look at the green in the table, get a feel for that for at least a year or until you get some fish harvested and step into the orange if you feel inclined. Completely avoid the red section of the table because it is quite difficult to sustain and completely inefficient way of growing fish. Much easier to grab another 1000 liter tank if you need more fish. Thanks for that clarification Paul. That’s exactly what I was wondering. Just one more question (I’m lying, of courselol); I assumed both were 2 loop because both have water exchange requirement. If the above is single loop, where does the water exchange fit in? Mineralization tank i.e. ‘Conscious Man’? It would be great to see the other table (of your systems) like this, with the eexpanded figures. This single loop system at 15 kg/m3 fish stocking density requires a water exchange of 113 liters per day to maintain a Nitrate level of 80 mg/L. The plant use of nitrate and its evaporation rate (under the conditions set out), only removes 40 liters per day. Meaning this system will need to exchange at least 73 liters per day on top of the evaporation to prevent the Nitrate from accumulating. The result is from a heavy feeding rate per m2 of 44 grams per square meter. This is lower than the UVI recommendation but this is because in this case we are feeding a higher protein level 50%. I will be breaking down my design more as the time permits. Hope that helps and thanks for the questions! In your other article, ‘Water use in integrated aquaculture’ you use what looks to be a similar chart; starting on the left with the stocking density per 1000 liters of water and on somewhere to the right a number of plants. the number on the to charts doesn’t match and are vastly different. Are they the same thing at all? What am I missing? Thanks Again for the great site! -Tim @ kz farm. This chart number of plants is based on published feed/m2 from UVI and the other chart is based purely on nitrogen mass balance. In my works I get down to 12g of feed per m2 where as UVI was 60grams/m2. This chart runs on 50% protein and the other is 32% protein. They are both very different charts. Perhaps I can clarify them more so to avoid confusion. To make it more clear, this chart is single loop, the other chart is my Earthan Loop. It is good you picked up on the differences in production as both methods are very different. Great article Paul very informative. I did not mean, but i have to correct you. Water exchange at 15kg/m3 density is 113 litres per day not 75 litres as you mentioned. Thank you I have corrected it. It’s amazing how much free and important information you are giving to the aquaponic community. Thank you for that Mr. Van der Werf. Do these questions make sense….under the column ‘media surface area’, do the numbers take into account the growing area needed for X number of plants? Let’s say 15kg stocking density needs a minimum of 30 m2. Is that 30m2 worth of moving bed biofilter media? Or can it be 25 m2 (moving bed) + 5 m2 (growing area for 101 plants)? Thank you very much. More power to earthan group! Yes you can split your filtration up should you want to. However, the square meters represents surface area of the media not the growing surface area. So if your media has a surface area of 100m2 per 1000 litres of it (1 cubic meter) then if your calculation says you need 50m2, then you would need 500 litres of that particular media. Thank you again Mr. Van der Werf. That clears up a lot of questions. I do hope you can come up with additional information pertaining to separate mineralization of the fish waste collected from the sedimentation tank and how putting back the extracted nutrients in the Aquaponic system can affect the feed input. Many thanks. HI Paul, love the post! In your summary; 31 degrees max for water temp. I am in the UK , and would be getting higher than 25 degrees, maybe averaging 22, does this make a massive difference to the figures? Lower temperatures will reduce the risk of ammonia causing you any issues. So no issues with your temperatures. Would keeping the aeration thought the whole system help that problem? I mean, like keepping the aeration at the Biofilter, Growbeds (DWC) and Sump tank? Yes aerating elsewhere in the system will help with the oxygen levels however you would still require the water in the fish tank be exchange enough to keep the oxygen levels in the fish tant at a sufficient level and keep the tank with the fish in at the lowest recommended level. The simple answer is the limiting factor is the physical size of the fish. The table does not account for size of the fish outside of the 500 gram “plate size” noted as the end harvest weight. If you are stage producing where you are moving fish from tank to tank once they reach a certain size or time in their growth, you can split down tanks as you suggest. If you have the two tanks, you may as well split the 60 fish (30 each) into both tanks if that spare tank is not being used. Moving fish is very stressful so if you can keep them in the same culture tank for their growout, great. Keeping in mind, species that require regular grading (eg barramundi) will need a tank to grade into throughout the growth stages. When talking number of fish in your tank, the stocking density will be limited by the species and the physical size of the fish, not just the total biomass. For example simply dividing the density (50kg/m3) by the weight of each fish (at 5grams) is not a great way to estimate numbers of fish to keep in a tank (=10,000 fish in a 1000 litres of tank water). Which ends up at 10 fish per 1 litre. Estimating that way can be useful for the basic estimations with small numbers of fish, but the same method also suggests we can put a 1 x 50kg fish in a 1000 litre tank, which you can not. So physical space comes into play. 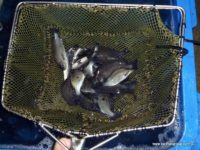 Small fish overcrowded may not perform well and will result in large variations in the individual size of the fish among the group… perhaps for another article. thanks for the clarification. While thinking about this “stage producing” method, I stumbled upon the question: “how do fish grow”? When writing my inital question, I basically assumed, fish grow linearly in weight over time, wich would suggest, after half the time, they got half their weight. Thats probably wrong, considering you constantly feed 1.x% of the fishes current body weight. just curious, not actually planning a stage production line. They do grow very quickly when young, so the growth curve starts out steep and then flattens out as they get larger. However, their feed rates are higher as a percentage of their body weight per day when fingerlings. Generally, you will average out your feed rate over the period of time for growth along with the feed conversion rate. Each fish species is different as you know. Your very gifted at explaining and providing information that is very helpful. I hope every new fish or Ap. grower reads this. I cant say it enough, thank you for your diligent hard work and effort and time spent trying to help others understand so we all can be more successful. Hi Paul, a fantastic and simplified but complete article. For five months I am reading about AP and the more I read, the less it seams I know. It is very frustrating. You have a gift of explaining the things with out BLALALALA…and it makes very much sens. I am based in South Africa and I want to build a system on my backyard , lets say semi commercial. A tunnel, 20 M x 10 M, with DWC and a little of growing media, but to decide on the final drawings, I see, it is a mission. One thing I do understand until now, the AP it is not complicated, but people makes’it to look like that. You are the best on the NET, on presentation of AP. Thank You and keep well…..
A great post Paul. Yes, there is so much WWW misleading information out there about fish numbers required to run a “balanced” system based on all sorts of “data”. I have learned over time some of what you have put into that table. How on earth I survived the 200+ then 400+ fish in our setup, I have no idea, perhaps because I over designed things. As you know, I have scaled things back to 100 fish thinking that was a fair number, but after paying much closer attention to nitrates this time round, not even that possible. I know now at the moment what feed input is required to run our system as it stands right now, without nitrate buildup. Working back from this gives me the fish numbers I can have to maximize their growth and keep their health. My aim is 6 months to turn the fish around @500g, white tilapia. Seems 30-40 fish is all that is needed to sustain sufficient nitrates without build-up. I had hoped for 200 fish when I set out in 2011, misleading WWW information led me to believe this was not an unreasonable expectation. Your numbers above are so much more realistic, could have saved a bunch of money and time and planned things better had I known then what I know now. How it goes hey, seem to love learning the hard way, LOL, not! It is really surprising how few fish you need to grow a ton of food, it still amazes me! I certainly want to grow more fish and will, but not by doing it within our existing AP system. I’ve learned so much from your posts and chats, thank you again. Lots of people out there publishing lots of stuff but they raise more questions for me than they answer and many make it appear more complicated than it needs to be and yet others simplify it so much it makes no sense. This is a superb post Paul. As with all of your posts, easy to read and easy to understand. Thanks for sharing your knowledge! Thanks for the feedback. Hope you find it useful. Great post Paul! Appreciate it a lot. Keep up the good work. Thanks for the feedback Vito. Appreciate it. Great article Paul very informative thanks for sharing. It may need a little more explaining but I think it gets the message accross to help clear up some of the “unknowns”. Thanks Paul.. shall come in handy I think..